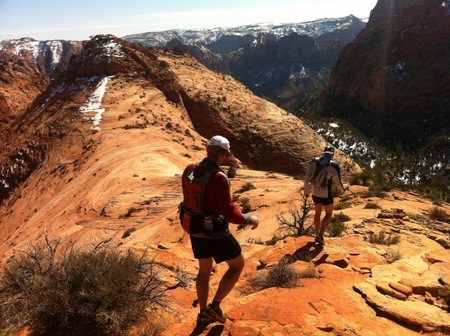 On February 25th, 2012 Ryan McDermott, Ben Lewis and I did a great loop starting/ending just east of the tunnel in Zion National Park. 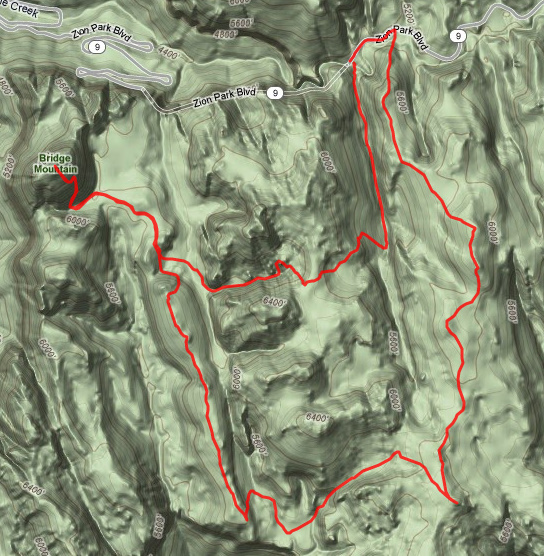 I was psyched to summit Bridge Mountain, run Marble Ridge, and hit the “Jenny Peaks”. I was operating at about -6dB due to an unfortunate sickness I had acquired several days before so I was fortunate to have friends that were okay with a more leisurely pace. Bridge Mountain is a spectacular and rarely submitted peak and for good reason. The route I chose doesn’t look very probably (as seen through a runner’s lens) from any vantage point and in reality it “barely” goes. It is indeed “a rugged run by running standards”. All other sides of the peak are well guarded making it a very special experience on top. I scared a mom and baby sheep right on the summit and they sprinted off on unbelievably technical terrain at a blazing pace. They make us humans look silly on chossy Zion terrain, I’ve got a lot to learn….. A few pics below and a full gallery of our adventure here. Ben’s write-up here. Lookin for u in silverton. We r back in r home, stop and say hello and good luck! See u at engineer. Cheers, Paul, Beck, Quinn and Liam. This looks awesome! was wondering how long it was and how much elevation? 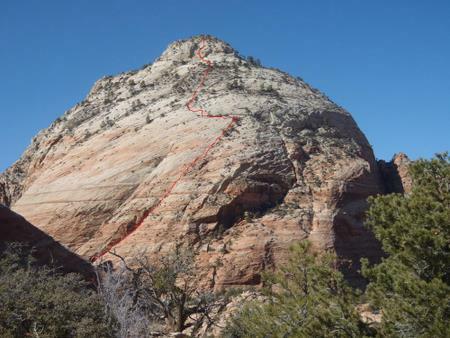 Bridge Mountain has probably been climbed less than 10 times ever. What a great loop – and you came straight down off the Jenny’s.